Islamabad (Agencies): A team of Chinese Socio-Economic Development experts will visit Pakistan in the last week of the current month to finalise the projects and their sites in already agreed six different areas under China Pakistan Economic Corridor (CPEC). According to spokesman of the Ministry of Planning, Development and Reform, the team will finalise the projects and their sites including health, education, water supply, vocational training, poverty alleviation and agriculture. The spokesman also clarified a news item published in a section of press regarding delays in implementation of CPEC, saying that none of the CPEC projects is facing delay; rather Pakistan and China are agreed on the future trajectory of the CPEC and timely completion of its on-going projects. 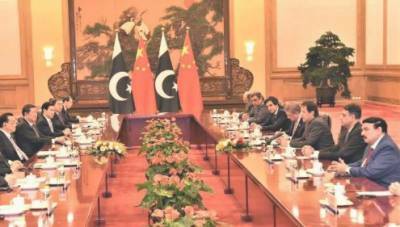 He told the successful 8th Joint Cooperation Committee meeting laid the foundation for the expansion of CPEC to new heights. For future, he said joint efforts are underway, focusing on socio-economic development and accelerating cooperation in industrial development as well as agriculture. The MoU on the formation of JWG on Socio-economic development and MoU on Poverty Reduction has been signed during the Prime Minister’s visit to China in November this year, the spokesman added. Recognizing the significance of Gwadar as an important node in cross-regional connectivity and the central pillar of CPEC, he said Pakistan and China have agreed to speed up the progress on the Port and its auxiliary projects. The groundbreaking of New Gwadar Airport, vocational institute and hospital are planned in the 1st quarter of this year. Huge investment is expected in the petrochemical sector at Gwadar, he told. Pakistan and China, the spokesman said have expedited the work on industrial cooperation under CPEC and the government has expedited development of economic zones by prioritizing Rashakai, Dhabajhi Faisalabad and ICT SEZs with a vision to make 2019, as a year of industrial development under CPEC.